Considering it's geographical proximity to Great Britain, a country steeped in skating tradition and its rich history, it's very surprising to realize that Ireland is one of the new kids on the ISU block. However, with a spirited and enthusiastic crew of organizers, judges, officials and skaters, Ireland's skating federation, the Ice Skating Association Of Ireland (ISAI), is quickly raising the profile of a lovable sport in their country and Irish eyes are definitely smiling at superb Salchows, spirals and spin combinations. On April 28, Irish skaters converged on the Dundonald International Ice Bowl in Belfast, Ireland for the 2013 Irish National Championships, with seven different events being contested throughout the day. Clara Peters won the senior ladies title yet again with a score of 95.43, while the senior men's gold medal went to Brendan Dorrian, with a score of 93.07. Junior men's gold was won by Conor Stakelum, with a score of 94.76 (the second best in the entire competition) and the junior ladies title went to Deirdre Feagre, with a total score of 43.68. 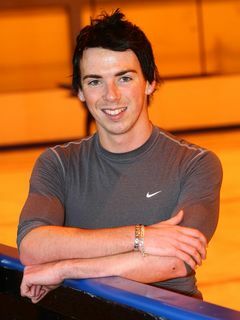 Sean Gillis, the Communications and Media Director for ISAI, explained "figure skating is a very young sport in Ireland and with a relatively short history compared to places like Canada, the US or Russia. We are very much at the beginning of our journey as a sport in this country. However, being able to hold an annual national championships as we have for the past number of years has been hugely important in raising the profile of figure skating here. There has undoubtedly been a lot more coverage in the local media due to this and we hope that this will translate into increased interest and funding for the sport. Of course, getting more people to take up skating is another goal of ours and the lessons that the ISAI has run the past few winters at temporary rinks have introduced the sport to a whole new generation who we hope will go on to develop and compete for Ireland internationally." Their skaters are achieving some great things already in international competition. Clara Peters, the reigning senior ladies champion, may be lacking in the triple jump count but what she lacks in technical difficulty she has certainly made up for in her sensitivity to music and well choreographed programs. Four times, she has represented Ireland at both the World Figure Skating Championships and European Figure Skating Championships, her best result at the World Championships coming in 2012, when she placed 29th in a field of 51 ladies skaters. 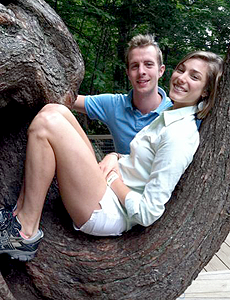 Peters will be among the skaters vying for an Olympic spot this fall at the Nebelhorn Trophy in Germany. The first skater to represent Ireland internationally, Peters currently trains in the U.S. under the tutelage of Karen and Ron Ludington. This is her fourth Irish national title. Brendan Dorrian began his skating career skating for Great Britain, placing in the top ten at the British National Championships more than once before deciding to represent Ireland and winning their national title, a feat he duplicated again this year. Having started skating at the age of ten, Dorrian is surely another Irish skater who hopes to realize his Olympic dream by competing and qualifying in the Nebelhorn Trophy competition this fall. With so many new nations taking up the sport competitively, it is absolutely heartwearming to see people across the globe flocking to the ice. Like music, skating is universal and I sincerely hope to see Ireland's skating program and skaters continue to develop and receive more funding and support in years to come - and that the pot at the end of the rainbow is filled with gold medals. For more information on skating in Ireland and its history, please visit Considering it's geographical proximity to Great Britain, a country steeped in skating tradition and its rich history, it's very surprising to realize that Ireland is one of the new kids on the ISU block. However, with a spirited and enthusiastic crew of organizers, judges, officials and skaters, Ireland's skating federation, the Ice Skating Association Of Ireland (ISAI), is quickly raising the profile of a lovable sport in their country and Irish eyes are definitely smiling at superb Salchows, spirals and spin combinations. Sean Gillis explained "figure skating is a very young sport in Ireland and with a relatively short history compared to places like Canada, the U.S. or Russia. We are very much at the beginning of our journey as a sport in this country. However, being able to hold an annual national championships as we have for the past number of years has been hugely important in raising the profile of figure skating here. There has undoubtedly been a lot more coverage in the local media due to this and we hope that this will translate into increased interest and funding for the sport. Of course, getting more people to take up skating is another goal of ours and the lessons that the ISAI has run the past few winters at temporary rinks have introduced the sport to a whole new generation who we hope will go on to develop and compete for Ireland internationally." 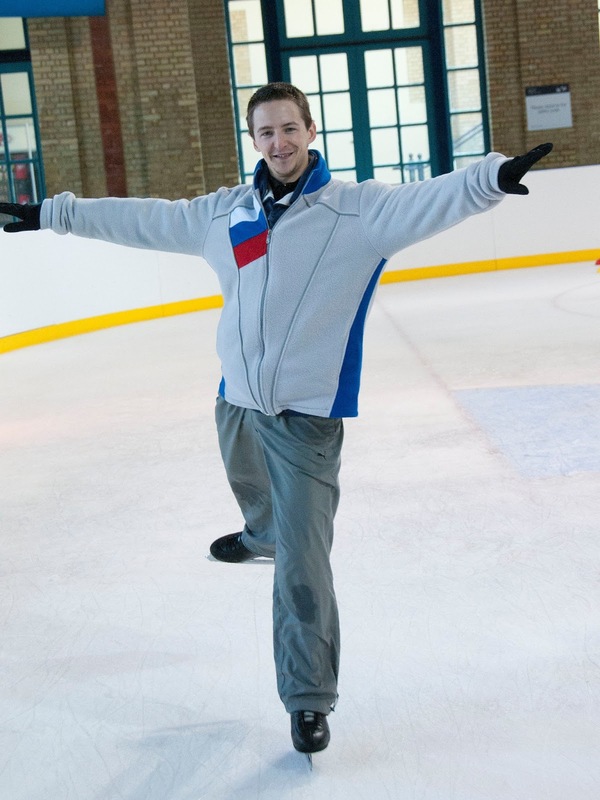 For more information on skating in Ireland and its history, please visit http://isai.ie/about/history. If you don't dance and just pull up your pants, you might be leaning back... and that's how the Cantilever is done. A variation on the spread eagle, a common skating move in the field where skaters glide on both feet, toes turned outward to the sides with heels facing each other, the Cantilever is a thrilling and gravity inspiring skating element with it's historical origins in early show skating. The Cantilever was invented by Werner Groebli, a Swiss skater who moved to the U.S. in 1937 and joined the cast of Ice Follies as a comedic show skater in 1939. In his long career as a professional figure skater, Groebli estimated he performed more than 12,000 shows before retiring at age 65 after injuring himself while skating in 1980 after an untimely collision with the boards. 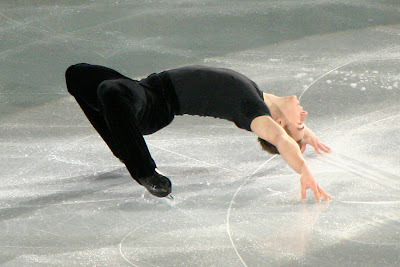 He performed the "backbend Cantilever" as a signature element with his skating partner. While Frick Cantilevered, Frack would skate in the other direction, hydroblading. The Cantilever can best be described as an element that sees skaters take on an inside spread eagle position and contort their bodies so that they are leaning backwards in a layback position with their head almost touching the ice. Adapted from Groebli ("Mr. Frick")'s comedic routines with Hansruedi Mauch ("Mr. Frack"), the contortionist like trick has been popularized by show skaters and ISU eligible athletes for decades since then, among them Canada's Shawn Sawyer, America's Doug Mattis and Ross Miner, Sweden's Adrian Schultheiss, Russia's Ilia Klimkin and even the Russian pairs team of Lubov Iliushechkina and Nodari Maisuradze, who have incorporated the spectacular and awe inspiring trick as both a solo and pair connecting movement in their programs. Hydroblading, a term coined by Uschi Keszler, the coach of World Champions Shae-Lynn and Victor Kraatz, who popularized the move is an extension of a deep inside or outside edge with the skater's body stretched in a very low and horizontal position to the ice. The most common version of hydroblading is on a back inside edge, with the skater's free leg crossed behind and the knee deeply bend and extended outside the circle, with the upper body leaning into the circle. I used to love hydroblading when I skated, and would always start by doing a back shoot the duck position then leaning into the edge and coming up in a back spin. It's certainly a dramatic move when performed well and definitely showcases the strength of skater's edges. Isabelle Brasseur and Lloyd Eisler were 1993 World Champions, and after turning professional, basically wrote the book on dangerous and crowd pleasing adagio pairs tricks, inventing many new adagio moves including the "Fly High, Say Bye", where Lloyd basically tosses Isabelle over his head like a pizza pie, catches and releases her. It's one of many acrobatic tricks that Isabelle and Lloyd invented, many of which have not been performed since or certainly not with the same confidence. If you want the audience to go beserk, you might want to do a backflip. It is a standard of professional skating, mainly because it was banned from ISU/amateur competition after Terry Kubicka performed it at the 1976 Olympic Winter Games and the association deemed it too dangerous. A backflip is essentially just as it sounds - a reverse somersault in the air. Many skaters have performed it over the years - from Scott Hamilton to Brian Orser to Robin Cousins and Ryan Bradley, among countless, countless others. A smaller group of women have ever successfully attempted this move - Lori Benton, Ashley Clark, Rory Flack Burghart among them. Surya Bonaly lands it both on two feet, and daringly, on one foot and straight into a double or triple Salchow. Now that's just cray cray! Even more cray cray is an adaptation that Michael Weiss performs, where he actually twists in the air while performing this daring move. I don't know how skaters do it, and still think it's the coolest thing ever. Just putting that out there. It doesn't get any more dangerous that the headbanger or "bounce spin". Like the backflip, it is considered illegal in ISU/amateur competition. The risky pairs move is performed by the man swinging the lady around with both of her feet off the ice, supported only by the man's grip on her ankle. The lady is elevated and lowered during the spin, often with her head coming shockingly close to skimming the ice. Many professional pairs teams have popularized this move over the years, including Isabelle Brasseur and Lloyd Eisler, Calla Urbanski and Rocky Marval and Anita Hartshorn and Frank Sweiding, who perhaps have the best in the business. It's always met by shocked and audible gasps from any audience that witnesses it. Show skating wouldn't be what it is without these gravity defying tricks of the trade or the skaters who dazzle the world with them. With so many other ingenius and creative movements and acrobatic feats out there, especially with the popularity of adagio pairs skating and some of the completely outrageous show act skating we see featuring aerial acrobatics, fire eating, barrel rolls and even Gary Beacom and Gia Guddat with skates on their hands, the old saying "everyone has a gimmick" rings true in every good professional figure skater's resume. The fact of the matter is, there's nothing wrong with a gimmick here and there. The goal of show skating is to thrill and entertain an audience, and if you can find a trick to it you're a step above the rest. Q: When people think figure skating, they don't necessarily think Brazil. What is figure skating like in South America and how has it has been to be a pioneer in bringing Brazilian skaters to the forefront? A: Yes, It is true that Brazil is not known for its strength in numbers when it comes to figure skating but it has been amazing to see how much the sport has been growing in our country for the last 5 years. We went from having no skaters at all to have 3 skaters break through the top 100 in the ISU world rankings. I feel honored to be a part of the beginning of skating in Brazil. Q: How has it worked training in North America and representing Brazil? Did you have to travel there regularly for a National Championship, etc.? A: In the past, Brazil has used Four Continents as a way of deciding our ranking in Brazil so I have not had the opportunity to compete at nationals in Brazil yet but I have been down to Brazil numerous times in the past few years where I did take time to go skate at the rinks in Brazil. It was an amazing experience to see all the talented little skaters there and get to show them the things that they can one day do on the ice if they keep following their dreams. Q: What is your biggest skating accomplishment to date? Your favourite performance? A: My biggest accomplishment to date in the sport of Figure skating was probably being 27th at the World Championships in 2010 when I beat Nobunari Oda from Japan. My favorite performance ever was just a few weeks ago in Italy when I brought my "Samba Hop" program back for the first time since 2010. It was just so much fun because I love that program and the crowd was great, even the judges were smiling the whole time J not to mention I broke my personal best score in the short program. Q: At what age did you start skating and where do you currently train? A: I start skating when I was 7 years old and I currently train at the Richmond Training Center in Canada. Check out the Twitter page for our rink at http://twitter.com/richmondTC. 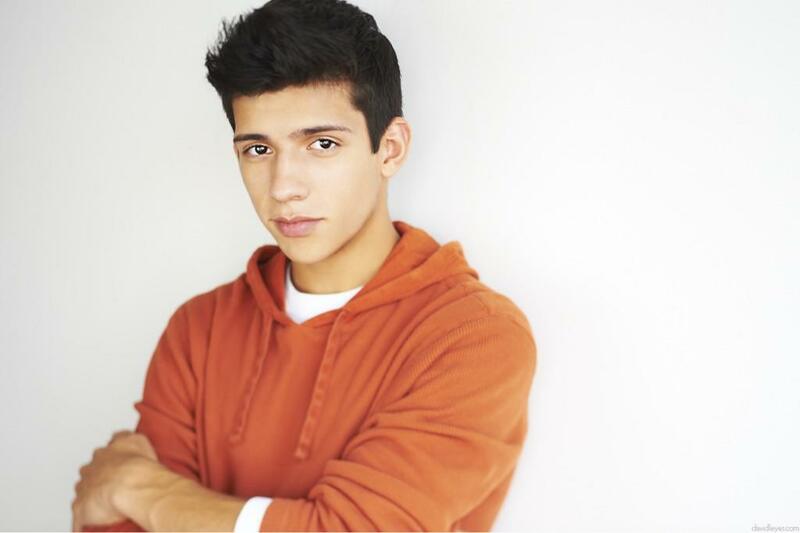 Q: In addition to being a very talented figure skater, you're also quite a popular actor, with a current role on "Degrassi: The Next Generation". How did you first get into acting and what has been your favourite role so far? A: I got into acting when I was young and being a skater also made me love performing even more. I did some commercials when I was younger but put acting on hold when I was 14 to focus on skating. Last year when I was injured I had more time again to focus a bit on Acting so it has been great to book roles on a few shows but my favorite was working on Degrassi because my character to this date was very ambiguous and I love that. Now that I am healthy again, I am now focusing on the Olympics this year. Q: Do you plan on competing next season? A: Absolutely! I have already competed in Slovenia and Italy this past month and am going to compete in the USA in Buffalo in May. All roads lead to going after the Olympic spot for my country. Q: Who are your figure skating idols? A: My biggest figure skating Idol is Kurt Browning because as a kid he showed me how much fun skating and performing can be. I have had the privilege of working with him on my "Samba Hop" short program. Q: What is your most embarrassing moment so far? A: I do not get embarrassed easily but when it comes to skating I have one. In 2009 at the Four Continents Championships in Vancouver, I landed triple flip and triple lutz for the first time in competition during my short program and I became so excited that I rushed my easy double axel and fell on that :P Still was a big moment for me in moving forward as a skater and taught me to stay focused till the end of every program. Q: What's your favourite song at the moment? A: "Mirrors" by Justin Timberlake because he is a genius and "Ai Se Eu Te Pego" by Michel Telo because it is such a feel good song to dance to. Q: What is one thing you would say to a young person who doesn't believe in themselves? A: I would tell them that the power of one’s choice can change your life. If you make the choice in your head that you want something in life and will work for it, then there is always a way to make that vision that you have for your life true. Sure, you probably won’t succeed right away, but if you are persistent and keep fighting for it, you can accomplish anything and no one can stop you, not even you. Success comes to those who except nothing but success in the long run but are willing to fail sometimes on the way there. I've been to my fair share of skating shows and competitions over the years (and been in more than a few myself, but certainly not at an elite level) and each time I've gone to watch one I've certainly never had killer seats. 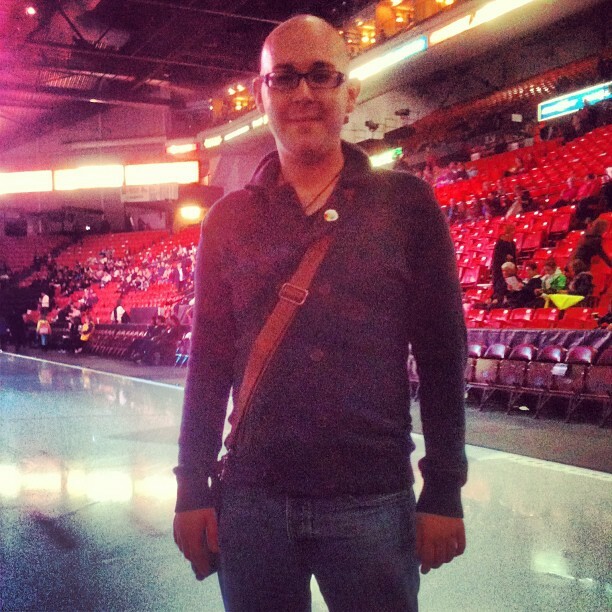 That all changed this year when my amazing sister, who spends her days working at rinks in British Columbia, treated my mother and I to on ice seating at Stars On Ice's Canadian debut in Halifax as a Christmas present. 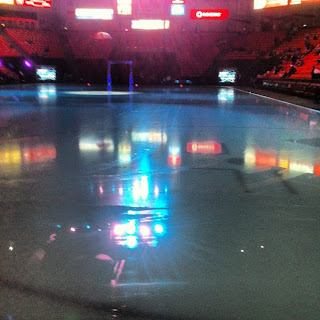 The seats couldn't have been more fantastic, with Joannie Rochette stepping on the matted area and back on to the ice literally right in front of us as part of the opening number's choreography, and skater after skater performing jumps, lifts and spins right in our faces basically. It was certainly a different experience altogether and from now on - on ice or not at all! The show's first act opened with a SICKENINGLY choreographed group number to Gotye and Kimbra's "Somebody That I Used To Know", with a very eerie Alice In Wonderland type theme (that's the only way I can describe it) with skaters using umbrellas as props. The umbrella theme was carried throughout the show right until the end. Three-time World Champion Patrick Chan's first number was set to Aloe Blacc's "I Need A Dollar", using a hat as a prop. I didn't take notes and wasn't able to live tweet as my phone battery was dwindling by the minute, but it was a well skated program with only one iffy landing and a minor issue with the hat, which he covered up nicely. U.S. Champion Ashley Wagner followed with a slower piece set to Billy Joel's "Vienna". I adore Ashley, and although I wasn't crazy about the program, she was on point all night throughout both programs and all of the ensemble pieces, with triple flips and loops all over the place, including one particularly gorgeous triple loop she landed literally right in front of me. I wish Ashley would hire me as her music person - her skating is simply too fabulous and I can think of about 20 pieces of music she could just rock. British Champions and Olympians Sinead and John Kerr followed with Adam Lambert's cover of "Mad World", which was just absolutely haunting. They skated this program on the U.S. tour as well and they couldn't have been any more spellbinding if they tried. And yeah, I totally have a crush on John Kerr and adore Sinead and was just drooling over their skating all night. Always the crowd favourite, Shawn Sawyer was up next with a very creative program set to Carl Orff's "Carmina Burana", a piece of music made famous in the skating world by the iconic Paul Wylie. Shawn gave it a very different interpretation, using a costume change from a cocoon or something into a butterfly (I don't have a sweet clue about biology girl). With a gorgeous Cantiliever, his trademark spins, spirals and backflips, Shawn was every bit as charismatic, innovative and truly artistic a skater as ever. Just love him! Now the next program featured two skaters I love as well - Joannie Rochette and Jeffrey Buttle, Olympic medallists both. The music was Dave Brubeck and Van Cilburn's "Piano Guys" and as much as I love these two, I really didn't care for this program or the music choice, although they were both very on, landing side by side jumps and really selling the program. After the duo was 4 time World Champion and 3 time Olympian Kurt Browning, who really IS Stars On Ice. I've seen Kurt skate many, many times and his first program, set to "Kurt's Song", like his "Antares" program especially composed by The Tragically Hip. What a gorgeous, breathtaking piece of choreography. He doubled his salchow but rebounded with a series of double axels and I have to say this was one of the PRETTIEST programs I've seen Kurt do. Next up were Tessa Virtue and Scott Moir, the reigning World silver medallists and 2010 Olympic Champions. They skated to Rihanna's "Stay" and you could hear a pin drop. A gorgeous, emotional performance from these two. Time for a shameless plug. If you like the song "Stay", you NEED (and I mean NEED) to listen to my dear friend Megan's cover: http://www.youtube.com/watch?v=ZDa_xz1m_DU. Megan's a SWEETHEART and I cannot rave about how beautiful her version is enough. World Champion Jeffrey Buttle followed with a jazzy program to Mel Torme's "Just In Time". Jeff was really on all night and sold this program nicely. I also don't remember seeing him miss a single jump all night. I could be wrong, but I doubt it. Olympic Bronze Medallist and Canadian Champion Joannie Rochette followed immediately with her first solo program, set to Sade's "Is It A Crime?". I'm a huge Sade fan - "In Another Time" is one of my favourite songs - and she really played to the audience during this program. Joannie is absolutely GORGEOUS in person by the way and continues to grow and grow as an artist. The first act closed with a group number featuring Tessa Virtue, Scott Moir, Kurt Browning, Jeffrey Buttle and Patrick Chan to "Wonder" by Naughty Boy and Emelie Sande. Another amazing piece of group choreography that I can only describe as enchanting and majestic. After a quick good Christian cigarette and a surprise run in with a dear friend who I didn't even realize was in town, we made our way back to our killer seats for the second set... I mean act. That's the drag queen in me coming out. The second act opened with a "Come Together" medley featuring music of The Beatles, Eurythmics and A. Skillz. I'm not sure who A. Skillz is but God love them. The whole cast looked like they were having a blast. All smiles! Shawn Sawyer followed with another amazing performance to "Seven Nation Army" by The White Stripes. Again with trick after trick and just so much personality on the ice, this program got a huge response from the crowd. Shawn is originally from New Brunswick so he is well known in the Maritimes, but it's not even that at all. He's just that good. Standing O. With their only solo performance, Meagan Duhamel and Eric Radford followed with the Artists Against Bullying cover of Cyndi Lauper's "True Colors". Being one of my mother's favourite songs, I was half afraid she was going to start bawling but she held up well and so did Meagan and Eric, who couldn't put a foot wrong as usual. Being the only true pairs performance of the evening, the crowd especially freaked over the throw, twist and lift, having not seen anything like that yet. If they don't medal in Sochi, I'm throwing a hissy. A big one. Ashley Wagner's second program was set to The Eurythmics - "Sweet Dreams". Anyone that knows me knows I am OBSESSED with Annie Lennox and actually impersonated her for years in shows so when the music came on I was just in my happy place. Ashley was a class act as always, and really seemed to enjoy this program. NOW.. the next two skates were in my opinion the two best skates of the night so hold on to your weave and let me rave. First was Jeffrey Buttle, who skated a mesmerizing program to "In This Shirt" by The Irrepressibles. It's that song about being "caught in a rainbow". I think it was on a YouTube video or something. I know I've heard it before somewhere and it was just like being in a trance or a Natalie Merchant "catatonic dance". Just a gorgeous program. Following Jeffrey with another one of the evening's top skates were Sinead and John Kerr, skating to "Coronach" by The Porridge Men, which they also skated in the U.S. tour. Now, not only was this a great program jam packed full of interesting lifts, choreography and difficult footwork (and not the crappy CoP stuff) but they were performing it in Nova Scotia, which to those of you who don't know the area translates to New Scotland. I'm a proud Nova Scotian and you wouldn't believe how proud people are of our unique culture, heritage and music here. Needless to say, a standing ovation where John pulled up his kilt and flashed each section of the audience. Disappointingly, he was wearing something under it. I want my damn money back. Wait, I didn't buy these tickets. Waa! Those programs were two tough acts to follow, but Joannie Rochette ertainly did it, skating to Caro Emerald's "That Man", another sultry (but more playful) number in a very burlesquey kind of outfit. I just love Joannie! Following Joannie was Patrick Chan, who skated to an old Muddy Waters tune called "Mannish Boy". And I have to hand it to him, he played with the audience, turned up the heat on those blues and put on a fantastic show. Enjoyed this way more than his first number. Next up were Tessa Virtue and Scott Moir with a BRAND NEW PROGRAM... CARMEN. Gotcha! No, really, they performed their very popular "Carmen" free dance and I could just hear PJ Kwong raving about it my head. Way better live and they really adapted it well. It was a big hit with the crowd! The final solo of the evening was "an oldie but a goodie" and I'm talking about the program, not the skater: Kurt Browning. Getting to see "Singin' In The Rain" live was an absolute treat. I first saw this program during one of Kurt's TV specials in the 90's and it was every bit as good, despite the only bad fall of the night. Kurt managed a nasty fall on his double axel that landed him on his stomach and really looked like it hurt. Like the true pro he is, he got up and continued to sell the program and earned himself a standing ovation as well. Being that close to the ice made a small part of me think "wow... I wish I was out there again". The last time I skated in front of an audience was in 2001, at my club's ice show. I skated to Emm Gryner's beautiful cover of "You Do Something To Me" and probably gave the best skate I ever had. I ended on a high note and put skating on the back burner in my life, always continuing to follow the sport but never seriously feeling that draw to the ice like I did here. In the last year I gave up performing as a drag queen after 10 years of that wonderful fun because it just wasn't serving me or making me happy anymore. In fact, it was making me miserable. I have to say, returning to writing and getting more involved in the skating community by WRITING about it is the best replacement for that hole in my life I ever could have found. I'm writing about something I'm passionate about, and I genuinely, genuinely think the world of all of the amazing skaters who have tugged on my heartstrings, made me cheer, laugh or even yell at a TV screen out of frustration when they falter in some way, or prove themselves human I should say. This show was no exception. Everyone was just fabulous. Follow this blog on Facebook at http://www.facebook.com/SkateGuard or follow me on the twitter at http://twitter.com/SkateGuardBlog. For more information about Stars On Ice (including ticket information), visit http://www.starsonice.ca. For years, Karen Preston thrilled audiences with her soaring jumps, musicality and thrilling performances. Winning the Canadian National twice (in 1989 and 1992), Karen represented Canada at the 1992 Winter Olympic Games in Albertville, where she delivered two VERY strong performances, finishing in the top ten. She represented Canada three times at the World Championships, finishing 11th, 9th and 7th. After finishing 3rd at the 1994 Canadian National Championships and barely missing the 1994 Lillehammer Olympic team, Karen turned professional. She toured with Disney On Ice as Snow White and competed as a professional, outskating skaters like Surya Bonaly, Elizabeth Manley, Rosalynn Sumners and Tonia Kwiatkowski in professional competition. Now a mother and a much sought after coach, it was my pleasure to have the chance to interview Karen and gain her perspective on the sport and it's major players and find out more about what she is up to now. Q: Who is the most interesting person in the skating world you have had the chance to work with over the years? A: It is hard to narrow this down. I was very luck to work with some of the greatest coaches in North America. I must say that my first competitive coach Wally Diestelmeyer was a huge influence, but Osborne Colson was also a major contributor to my career. Finally without Ellen Burka I would not have made the Olympic team, so I guess those are my top three. Q: You were very much involved in competitive professional skating. Do you think that the lack of competitive opportunities for professional skaters has helped or hurt the sport? A: To be honest, I was not as involved as I had wished to be. Many of the events were invite only, and run by a sports agency that I was not a client of. I think that in the "golden days", post Kurt Browning, professional events could have been better attended and skating could have had a longer "golden era" if a more diverse group of skaters had been asked to participate. I think that skating took a huge hit in Salt Lake City, and the average TV fan doesn't understand why someone who falls three times wins against someone who stands up. It gets confusing and hard to follow. As for nowadays, it would be great if we had some more events, but it can only happen if there is a huge demand. I feel that demand is presently in Asia, where there are a lot of opportunities. Q: What are your thoughts on the current state of Canadian skating? Who are your favourite Canadian skaters of all time? A: I think Canadian skating is enjoying the rewards of a lot of hard work from coaches, athletes and Skate Canada. I was so proud of our skaters in London this year - mostly of Kaetlyn Osmond. I am so tired of hearing "What is wrong with Canadian women?". Nothing!!! It is a tough sport - you need a go-getter with guts to compete in it. You also need the support of an association and I think Skate Canada under Mike Slipchuk's eye is doing a better job of that. I can tell you that there were times that the CFSA was not supportive of its athletes in the past and it takes a special person to hold their head up and compete hard and WELL without the support of the association. My favourite skater... Canadian skater of all time??? I idolized Brian Orser as kid. I was in awe of Jamie and David in Salt Lake City and thrilled by Tessa and Scott in Vancouver... too many to pick just one. Q: What was your favourite program you ever skated and why? A: My short program at the 1993 World Championships, because I finally got to be who I really was on the ice. This is followed by my clean long at the 92 Olympics....because it was the jewel in my crown after a lifetime of hard work. Q: Who do you think will be the next Olympic ladies champion? A: Most likely Yuna Kim repeats, but I would sure like to see Carolina Kostner give her a run. Q: Where are you currently coaching and what is your coaching philosophy? A: I currently coach at the Canadian Ice Academy in Toronto. I had 5 skaters make Nationals this year while attending U of T full time to finish the degree I stopped in 1992 to focus on my own skating. SO, I am very proud of my season. My coaching philosophy: I am at the rink because I love skating, have since I was 5. I tell my kids to focus on the journey: the good and bad. It all makes you who you are. The sport will give back what you put into it. I am also partial to saying "keep calm and carry on, I will tell you if it is EVER time to panic." My job is to get skaters to be the best athlete they can be, enjoy the sport for a lifetime and leave competitive skating with a positive view of their achievements. Q: What have you learned the most from figure skating? A: That true courage comes from within, fail to plan and you will fail. Be ready, be organized and love the journey. Follow the blog on Facebook at http://www.facebook.com/SkateGuard or on Twitter at https://twitter.com/ohh_N!